Mitsubishi RDT233WX-3D - Is This the First 3D IPS Monitor? LG E2770V Updates - What Panel Technology is it? Over the last few months we have brought you bits and pieces of information regarding the interesting new SA850 monitor from Samsung. The main reason for the interest in this model is the fact that it will be the first to use Samsung's new Super Plane to Line Switching (S-PLS) panel technology, designed to rival LG.Display's IPS technology, and a move away from their traditional investment in PVA. Through various early photos of the screen we have been able to gather bits of information about the SA850's spec, features and design. We also discovered the Samsung panel part details which will be used in this screen, with a full spec and details obtained for the LTM270DL02 panel. This week Russion review site fcenter.ru have managed to take an advanced look at the SA850 ahead of its full release. It's unclear whether this is a full final version of the screen of an advanced pre-production model which could have further tweaks and changes. For now, we can at least read more about their findings which gives us more of an insight into this new screen and Samsung's PLS technology as a whole. The review itself is carried out by Oleg Aramonov who also provides the English translations of the reviews when they are published on Xbitlabs.com. Obviously you can read the full review on the fcenter.ru website, but I wanted to summarise a few of the points of interest here. We hope to feature a full review of this screen ourselves once it is made available to us. There are 2x DVI and 1x DisplayPort available. Oddly these are positioned on the side of the back of the screen which could present issues with cable management? The power pack is external but can be attached to a bracket on the back. Again, oddly this is attached sideways. There appears to be a very low contrast ratio (~537:1 default) measured. It remains to be seen whether this was a pre-production issue, strange measurements or a (diappointing) reality. The sample reviewed had poor panel uniformity, hopefully something addressed in the final version, or are Samsung's PLS panels subject to questionable quality control like some of LG.Display's e-IPS panels? Viewing angles are said to be excellent, which is good considering this was a key selling point according to early Samsung press releases. Blacks are consistent when viewed from an angle which is superior to e-IPS panels. The review concludes that the monitor proved to be pleasant but not perfect. Interestingly they state that the final release is still 3 months away and hope that Samsung will address the uniformity issues during that time. Please read the full review for further insight. 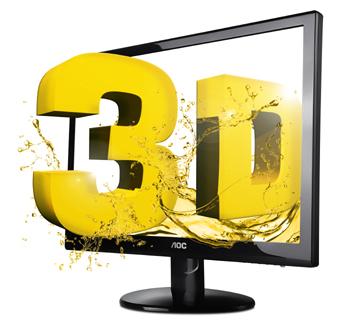 AOC are the latest to bring a 3D capable monitor to the market with their 23" e2352Phz. The press release states "As soon as the 3D setting is switched on, the action in 3D videos and games is within the user’s grasp. Using polarising glasses, users experience the thrill of spatial depth. Even the most fast-paced action scenes are rendered smoothly by the e2352Phz thanks to its quick response time of five milliseconds. High resolution content is received by the Full HD monitor via an HDCP compatible HDMI input. The e2352Phz also gives an excellent performance in 2D mode and therefore is not only suitable for entertainment, but also for workplaces at home or in the office. Its large display area easily provides enough space for complex tables and double-page texts." So it looks like this new model will not be a 120Hz / shutter glass 3D screen, but will use passive 3D technology and polarizing glasses like some other models emerging. See our news piece about the Mitsubishi RDT233WX-3D for more information. 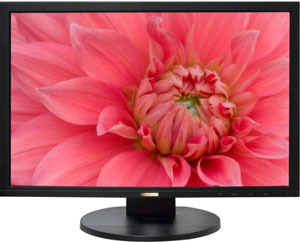 Philips are set to release a new 27" monitor in their 'Brilliance' range of screens. The 273P3L will feature W-LED backlighting and combines this with a TN Film panel. Unlike a lot of modern IPS 27" screens the panel used will only offer a 1920 x 1080 resolution as opposed to 2560 x 1440. Those that like low power draw will be pleased to know that their "PowerSensor" technology was included in the construction, with a built-in sensor that lowers screen brightness when users aren't in front of it, leading to power savings "of up to 80%". Release is not confirmed but expected soon with a retail price of ~ 390 Euro. At this years SID 2011 event last week, LG.Display demonstrated their latest innovation in Smart Mobile panels. The so-called Advanced High Performance IPS (AH-IPS) panels deliver an ultra-high resolution and are notable for their superiority in smartbooks (tablet PC's) and smartphones. LG Display will introduce a full line-up of products that employ IPS technology to deliver ultra high resolution, including 3.5- and 4.5-inch panels for smartphones, 7- and 9.7-inch panels for smartbooks, and 55- and 84- inch panels for TVs at the exhibition. In particular, by highlighting the strengths of AH-IPS, the company plans to solidify its competitive edge in the smart mobile market. The Company is already enjoying dominance in technology, supply capability, and cost competiveness based on its extended experience in mass production. 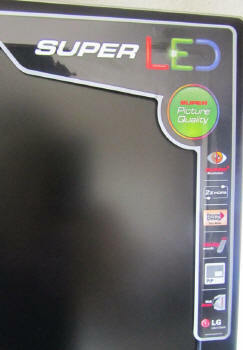 AH-IPS technology, an advanced form of IPS, has realizes 1.5 to 2 times the resolution of typical LCD panels. This ultra high resolution becomes particularly valuable when the emphasis is on displaying highly detailed images. The technology also improves display's color accuracy, which in turn leads to reproduce the original color precisely without color distortion. In addition, it provides greater light transmission which translates into lower power consumption while delivering exceptional picture quality, making it ideal for use in outdoor settings. Resolution is generally defined by the total number of pixels whereas image crispness is measured by pixels–per-inch (PPI) which refers to pixel density per unit area. The ultra high resolution technology employed by AH-IPS adds a greater number of pixels than the PPI that can be recognized by the human eye at a typical distance. This makes it more difficult for the naked eye to distinguish each individual pixel, thus making the image sharper. LG Display’s 3.5-inch smartphone panel supports 960x640 pixel resolution at 326 PPI, delivering the most detailed images among smartphones available on the market. A further LG.Display monthly newsletter talks about the advantages of AH-IPS panels in these applications compared with MVA equivalents. It talks about superior viewing angles and an energy saving of 15%, using only 2.9W of energy. At the moment there is no talk of LCD monitor panels using these kind of panels although we have already seen ultra-high res 27" panels from LG.Display in the past of course. 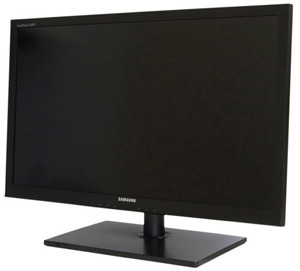 Back in March we brought you details of Samsung's 27" C27A750 monitor which would feature innovative wireless capability allowing you to connect external devices to the monitor without the need for cables. Samsung are now set to release a 23" model also featuring this Ultra Wide Band (UWB) technology. Samsung's website states: "Features such as USB3.0, USB Hub (with 4 USB ports) and the stylish wireless dongle open up huge possibilities. And then there is Auto Wireless Detection, superfast data transferring and fast built-in LAN connections for a streamlined performance. The CA750 even allows for multiple note PCs (with a dongle) to wirelessly access it, while with a cable connection, any individual PC can establish a connection – a truly fantastic idea that’s now a reality. So, experience the ultimate wireless hub with the CA750 Hub Monitor." The screen will use W-LED backlighting and offers a 2ms G2G response time from its TN Film panel. The screen will of course offer a full 1920 x 1080 resolution as you'd expect from todays market. There's a whole host of additional features like the USB 3.0 support and ethernet connections. See Samsung's website for the full spec and list. Release is expected in Koreo first at around KRW590,000 (about $540 USD). Although the release of the Hazro 27" HZ27WA and C has been very popular thanks to their spec, features and very low price point; some have been disappointed to receive units with trapped dust behind the glass screen coating. The glass front obviously gives the screen a glossy appearance and many users find it helps provide a crisp and vivid image, and is often preferred to the aggressive AG coating of some competing models in the market. However, where dust has become trapped behind the glass it has proved frustrating to many users resulting in some complaints and returns. This issue hasn't affected everyone but for those who are worried about the possibility of trapped dust, or simply just want the screen without the glass coating, Hazro have now started producing the HZ27WA and HZ27WC units without this glass front due to customer demand. The rest of the spec and features remains identical, they have simply not attached the glass front. The new screens are being produced and are available to pre-order from the UK distributor Overclockers.co.uk. They will retail at the same price as the glass version which will also still be available as before. At the moment they are also on special offer at £374.99 (inc VAT) for the HZ27WC and £479.99 (inc VAT) for the HZ27WA. Following the recent news of the ultra-thin (0.39 inches, 9.8mm) 21.5" L2201x display, HP are now set to release a slightly bigger 23" model with a similar selling point. The new x2301 will also be 0.39 inches thick but this time the screen size is 1.5 inch bigger. 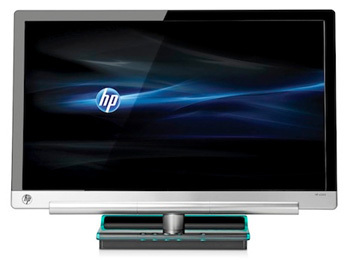 The screen is reported to feature W-LED backlighting and offers a brushed aluminium bezel and multiple connections including VGA, DVI and HDMI. The screen will be TN Film based but features a low 3ms G2G response time and even a glossy screen coating. Release date is expected in June with a retail price around $279.99 USD. 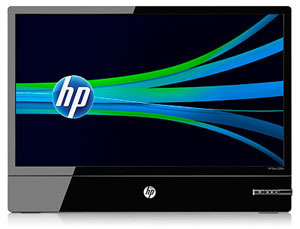 For some pre-release thoughts and tests of the screen see HP Communities here. At this years SID 2011 event Perceptive Pixel have shown off the World's first 27" Multi-touch desktop display. "This is the first and only solution with performance and a form factor appropriate for professional users in fields such as geo-intelligence, digital content creation, computer-aided design (CAD), energy exploration, medical imaging and other visualization-intensive sectors. The new 27" display empowers users to work directly on screen to access and manipulate complex data and workflows, leading to higher productivity and faster decision-making" said the press release. “This is literally the most advanced desktop display in the world,” said Jeff Han, founder, CEO and chief scientist at Perceptive Pixel. Until now it has been technically impossible to produce a screen of this size with true and reliable multi-touch support. While projected capacitive technology is widely used in smaller handhelds and slates, it is notoriously difficult to deploy at large display sizes or if the sensor glass is placed close to a display due to electrostatic interference from the LCD panel itself. To date, the industry has barely been able to achieve 24"+ diagonals; and in order to do so, manufacturers typically distance the sensor glass so far from the display, and with such a stiff thickness, that the resulting parallax makes the device unusable for serious applications. Worse, visual quality suffers tremendously from such a construction. Perceptive Pixel engineers have achieved an industry first by optically bonding the sensor glass to the display, completely solving the parallax issue and resulting in gorgeous optics, while achieving an even better touch performance and an industry-shattering response time of under 1 millisecond. (for touch support, not pixel response times). The display is optically bonded which results in very low touch parallax (the distance between the display image and the touch surface), eliminates inter-reflections for crystal clear, uncompromised visual clarity and is a mechanically robust, durable surface. The display is available immediately for purchase. Perhaps one day we will see it incorporated in mainstream desktop monitors as well. Perhaps these screens have been around for a little while, but we have not seen anything about them before. They appear to be a new range of IPS screens in sizes of 24", 27" and 30" from US manufacturer DoubleSight. Of particular interest is a new 24" model, the DS-245V, offering a 1920 x 1200 resolution which is quite rare in modern releases. The DS-245V also features integrated stereo 2W speakers. It is available from DoubleSight direct at $450 USD although this is likely cheaper if you buy from other US retailers. DoubleSight have also updated their 30" range with the DS-307W. 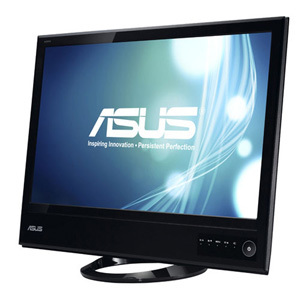 Their website states: "Experience the future of LCD Monitors today with the latest release from DoubleSight Displays. 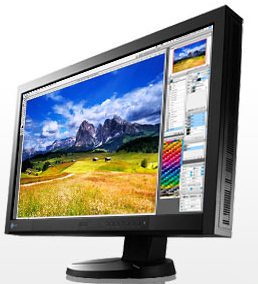 Whether for Home or Office, Graphic Design to Games, the new DS-307W Series Wide Screen LCD Monitors provide sharp, crystal clear images and fast response times which make them well suited for even the most demanding applications. A true asset to the Desk Top, this monitor features a sleek brushed aluminum design sure to stand out on your desk. Features include a S-IPS panel with 2560 x 1440 resolution, built-in Dual Scaler, support for Multiple input formats including Dual Link DVI-D, Adjustable Monitor Stand and 3 year Warranty." The screen has the same specs as the popular Dell U3011 and I expect it is using the same panel. Like the DS-245V there are also integrated speakers on the DS-307W. It is available from their online store at $1,479 USD. 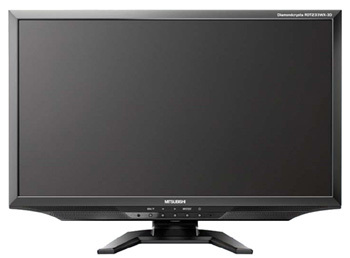 Finally, DoubleSight also have two 27" models in their range, the DS-277W and DS-275W. The DS-277W offers a sleek aluminium design, while the DS-275W is a little lower cost due to its slightly more limited spec and features. The DS-277W is available for $1,199 USD from their website, and the DS-275W is available at $999. The new Hazro range has been available in the UK for a little while now, with the main UK retailer being overclockers.co.uk. However, until now the screens have not been readily available elsewhere in the World. You can now purchase these very well priced IPS monitors from Hazro's website direct at www.hazro.com and they are available to ship within Europe and now also to North America. Currently the screens are priced as follows on Hazro's site (inc VAT): HZ27WB at £478.80, HZ27WA at £503.99, HZ30Wi at £649 and the HZ30Wi-Q at £699. We have tested and reviewed all of these models with the exception of the HZ30Wi-Q and they all offer some impressive performance and features considering the very competitive price. Please see the reviews for further information. As a word of caution there have been some early user reports of trapped dust behind the glass of the HZ27WA model, but these are reportedly going to be improved with recent batches. It is not an issue which has affected every buyer, but something to be cautious of perhaps. Screens are shipped with the appropriate power connections for the country. 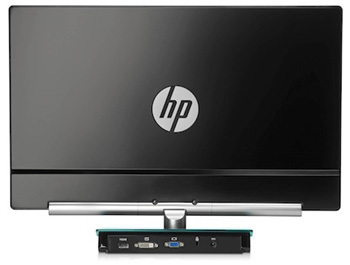 HP are set to release a new super-slim W-LED monitor into the market. The L2201x will feature a 21.5" screen size and seems to be focused around its thin 10mm profile and environmentally friendly technology. The screen will use an AMVA panel and offers some interesting specs including a 5000:1 static contrast ratio. We have already seen good things from some other modern W-LED / MVA panels like the BenQ EW2420W in this regard. The screen will feature only a DisplayPort interface and just a tilt adjustment from the stand. Release is expected in June with a retail price of around $250 USD. Dell are set to release a new 24" monitor in their ever-popular UltraSharp series later this year. The U2412HM will be the replacement for the U2410 monitor and is the latest in their refresh program which usually takes place every 1 - 2 years. We don't have full information about this screen yet, but we do know that the U2412HM is expected to be 16:9 format, and so a break from their previous 16:10 format models (the 'H' in the name signifies 16:9 aspect screens). It will feature a full 1920 x 1080 resolution of course and will be White-LED backlit. As with all their recent UltraSharp models the screen will use IPS panel technology. This will be e-IPS classification which is signified by the 'M' in the product name, and being W-LED backlit the screen will be standard gamut. It is expected to offer a coverage of ~80% of the NTSC colour space. This is obviously a change from the wide gamut U2410 but is in line with current market trends. Details about features and other specs are not known at this time but this must also be a new IPS panel from LG.Display since at the moment they do not have a 16:9 format IPS module listed. The screen will also remain with a matte AG coating and they will not be reverting to glossy coating at all. We know the screens will feature DVI-D and DisplayPort connections but the rest of the interface options are not known yet. At the same time Dell will also be refreshing their 23" and 21.5" models to replace the U2311H and U2211H. These will also be 16:9 format, e-IPS based and W-LED backlit. They will be called the U2312HM and U2212HM respectively. Release is expected sometime in Q3 this year for all three models. As soon as we have more information we will report back and we will of course feature full reviews of them all once available. We don't know what the screens wil look like or how they will be priced yet. Unlike the current range of 3D screens which use 120Hz input and shutter glasses for 3D (SG 3D), this new monitor will operate differently. The current SG 3D screens use an extended 120Hz refresh rate so they can deliver 60Hz per eye using the compatible shutter glasses, as promoted by NVIDIA. This does have issues with flickering, crosstalk and reduced brightness and so other manufacturers have focused on alternative ways to deliver 3D displays. Being IPS based, this screen will use a panel from LG.Display. Although they have used SG 3D technology, their primary approach to 3D content will now be through the use of Film-type Patterned Retarder (FPR) technology (FPR 3D). This was designed to eliminate the aforementioned issues with SG 3D methods and is also reported to be easier on the eyes after prolonged use, reduce dizziness and offer more comfortable and lighter 3D glasses. This is the technology used in the new Mitsubishi monitor. The screen uses passive polarization to achieve 3D support and will come with a different type of 'passive' polarized 3D glasses. In LG.Display tests these are reported to be much lighter than SG 3D glasses. The screens themselves will not use 120Hz input and instead only operate at 60Hz as a normal screen would. Thanks to the passive polarization you will be getting just half of the horizontal lines (vertical resolution) per eye, meaning 1920 × 540 pixels per eye. This is something that you should be aware of as it is not the same as perceiving two full 1920 × 1080 frames. Unlike SG panels, which produce 3D efect in the glasses, LGD’s FPR panel produces 3D efect in the panel itself – a true 3D environment that is a generation ahead of existing technology according to LGD. Dr. James Sheedy, Director of the Optometry Research Center at Pacific University in the U.S., delivered a lecture entitled "Vision and 3D Display.” Dr. Sheedy highly praised LGD’s FPR 3D panel saying that “Problems with the SG type panel included the weight of the glasses, power consumption and reduced brightness. 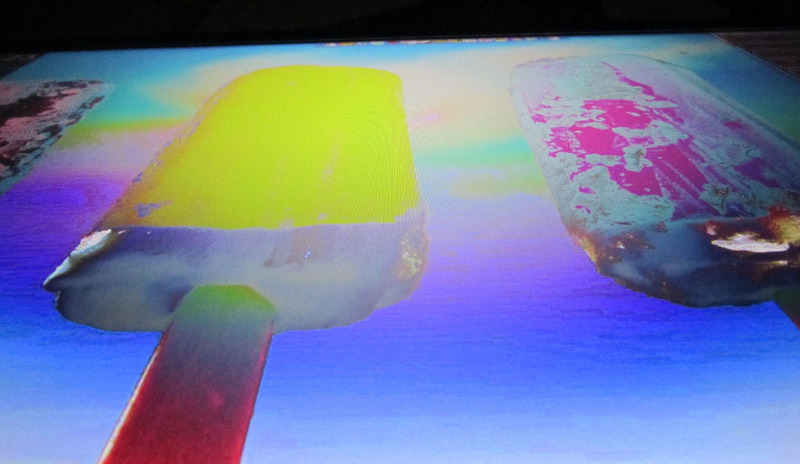 However, LG Display’s FPR 3D panel has no lickering, produces minimal cross talk and delivers a bright screen. Also, the glasses can be made with curved lenses, like regular glasses, so it is superior in terms of protecting eyesight." There were a lot of disputes in the industry over the last few months debating which is really the superior 3D technology. Samsung had lashed back defending their 3D technology and slating LG's FPR technology. LG even held a press conference in March titled "proving the superiority of FPR 3D displays" to counter this and firmly believe the consumer will have the final say in this matter. LGD President Kwon said that 3D technology has evolved from the 1st generation of SG, where glasses played a big role, to the 2nd generation of FPR, which has minimized the role of glasses, and projected that ultimately, it will become glasses-free. However, he added that commercialization of glasses-free 3D will take some time, due to the problem related to resolution as well as the involved cost, and therefore, FPR is the real 3D technology that relects the needs of consumers, the technology that will revolutionize the market. At the Q&A session, held after the speech, President Kwon revealed that five Chinese companies are currently manufacturing or have plans to manufacture TVs using FPR 3D panels, and world-renowned companies in the US, Europe, and Japan have also begun purchasing FPR panels. In addition, he said that he also expects more monitors to be produced using FPR 3D panels, and he is conident that LG Group’s FPR 3D will become the new standard of the 3D market. The screens full name is the Mitsubishi DiamondCrysta RDT233WX-3D and it will come bundled with a pair of passive 3D glasses. It will offer a full 1080 HD resolution, fast 3.8ms G2G response time and 5000:1 dynamic contrast ratio (modest for once!). 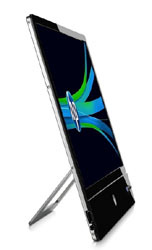 There will be tilt and height adjustments from the stand and the screen will feature integrated 2W stereo speakers. The screen will also be W-LED backlit. There are 2x HDMI 1.4a, DVI and D-sub connections available. 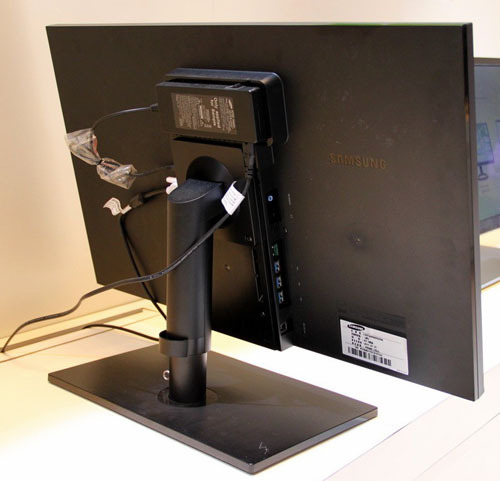 The presence of an additional D-Terminal or D-tanshi analog video connector on this display probably means that it will be available only in Japan, so don’t get your hopes too high in getting the product in Europe or North America yet. Release is expected towards the end of May at an expected price of ~$645 USD. We recently announced details of a forthcoming 27” model from LG, their E2770V. At the time the information from LG suggested this was an IPS panel, but recent developments have led to a lot of confusion as to what technology is actually being used, with the possibility emerging that this is in fact a TN Film panel. It’s an interesting topic and I thought it would be useful to summarise the varying arguments here. We are also trying to clarify with LG once and for all so will report back when we know more. The LG USA spec states a 14ms response time which is a classic modern day e-IPS response time for panels without overdrive (e.g. NEC EA232WMi and EA231WMi). If it were a TN Film panel then it would surely have a low 5ms response time at least, even without RTC technology being used? LG’s Japanese website lists “TN” in the specs tab along with 170/160 viewing angles and a 5ms response time. These specs on their site do clearly suggest TN Film and match a known LG.Display module. 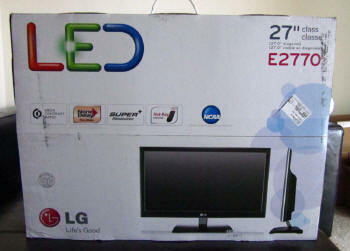 The E2770V box does not mention IPS, neither does the sticker on the side of the screen. This is usually mentioned on other displays. Perhaps the best test we have right now is a photo taken from someone who has purchased the screen already. This photo from below shows characteristic darkening and colour inversion of the image, although it does seem to be to a lesser degree than some TN Film panels. If we were to assume the panel was IPS, there is the added issue that the manufacturer of these panels, LG.Display, don't currently have a 27" IPS panel listed on their website which is 1920 x 1080 resolution. They only have the LM270WQ1 and LM270WQ2 modules which are H-IPS with 2560 x 1440. 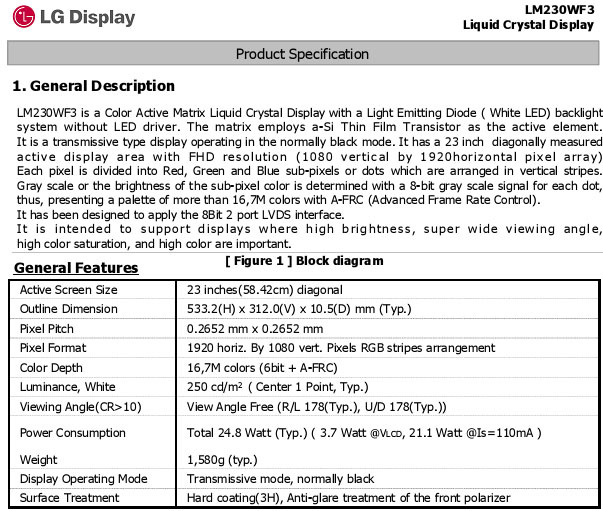 There is an LG.Display TN Film panel (LM270WF2) which matches most of the spec except the 14ms advertised response time and 178/168 viewing angles from the USA website. The WF2 module matches the Japanese spec correctly though. Our apologies if our original news piece was incorrect of course, we were basing it on the information available but it does seem that there is a lot of uncertainty from LG about this particular screen. We will clarify with LG as best we can and hope to feature a review at some point as well. More info as we get it. On a side note, several people have asked about the 120Hz TruMotion support. We have some information about this technology in our 'advanced technology' section of the site. We brought you some news at the beginning of the month about the forthcoming 24" and 27" S-PLS panels from Samsung, including details of their specs and part numbers. 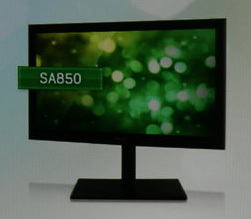 We have some brief updates regarding the first monitor to use this technology, namely the Samsung SA850. Courtesy of PCpop.com we have some new high res images which tell us a little more about this interesting screen. The screen appears to have a brushed aluminium lower bezel around the control buttons as shown above. The rest of the bezel appears to be a dark plastic finish. The above image seems to suggest the screen has an external power supply brick as opposed to being integrated into the screen. Here it has been attached to the back of the screen. Final design could of course vary. 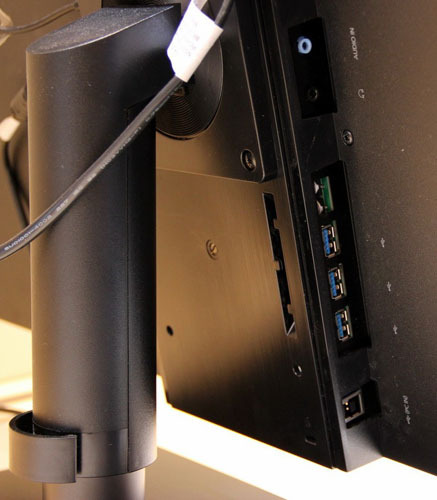 There are 3x USB ports integrated in the back of the screen as well, which are expected to be USB 3.0. As expected there is a decent range or ergonomics here as well including height, tilt, swivel and rotate. As well as two DVI interfaces (presumably Dual link to handle the resolution of this screen) there is a DisplayPort included as shown above. More information and a review of this screen as soon as we get it. Other details about the spec and features was discussed in our original news piece here. LG have recently released details on their website about a new 27” model in their range. 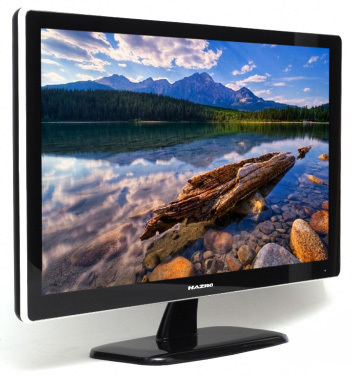 The E2770V boasts a large screen size and IPS panel technology. The screen has been aimed at gamers it seems with several interesting features and specs to note. The panel offers a 1920 x 1080 resolution first of all, and so this is not one of the current 27” IPS modules that are commonly used since those are higher 2560 x 1440 resolutions. It looks as if this will be a new module from LG.Display, probably part of their e-IPS range. The screen offers a reported 14ms response time according to LG’s website, but some sources have also mentioned a 6ms G2G response time. You would hope that RTC technology has been used to boost pixel responsiveness if this is aimed at gamers. LG are also touting its ‘Super LED’ backlighting unit which also allows them to boast a 5 million:1 dynamic contrast ratio. The panel will be W-LED backlit of course and DCR figures should always be taken with a pinch of salt. For gamers there is a Thru Mode option available, designed to bypass internal electronics and reduce input lag. 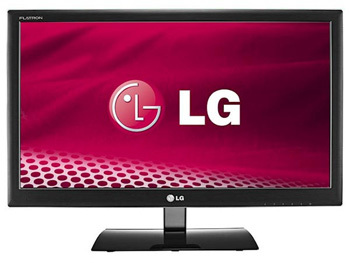 LG have also incorporated their 120Hz TruMotion technology here which is normally reserved for LCD TV’s and not commonly used in desktop monitors. As opposed to a true 120Hz screen (which would also support 3D content), this is an interpolated 120Hz. It’s operation involves Motion Estimated Motion Compensation (MEMC) which “estimates” intermediate frames and inserts them in between the normal 60 frames being produced from a normal 60Hz signal. This creates an interpolated 120 frames which is designed to improve perceived motion blur. It has been used for a considerable amount of time in LCD TV’s, with further versions giving rise to higher frequencies such as 240Hz TruMotion through other techniques. It’s good to see 120Hz TruMotion included in a desktop monitor for a change, although buyers should be wary of the differences compared to a true 120Hz input and support. Release date is not confirmed at the moment but it is expected to retail in the US for around $440 USD. Acer are set to introduce two new monitors into the market which are 24" and 27" sized and feature VA panel technology and W-LED backlighting. The (quite frankly stupidly named) 27" model is the B273HLOymidh while the 24" model is the B243HLCOymdr. Amongst their specs listed below is a crazy 10 million:1 dynamic contrast ratio. Will manufacturers ever stop with these ridiculous numbers? Why not just go with "infinity:1"? The screens will reportedly come with a 'Zero Bright Dot' guarantee (no dots will remain permanently bright) and are primarily aimed at office users. Release date is not clear at the moment but the 24" model is expected to retail for ~249 Euro while the 27" model will retail for ~399 Euro. 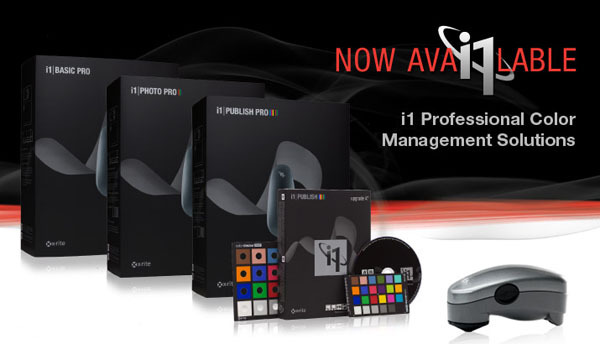 X-rite has recently announced their new i1 Professional Solutions. Their press release states: "Designed to accommodate all levels of proficiency and expertise, these high performance solutions consisting of a combination of hardware, software and comparative color targets are specifically focused on meeting the unique needs of photo, pre-press, and publishing professionals, providing exceptional value at very attractive price points. The new portfolio is comprised of i1Basic Pro, i1Photo Pro, i1Publish Pro and i1Publish (software and target suite). All four feature groundbreaking new i1Profiler software technology designed to accommodate all skill levels, and provide the power and control needed to create the highest quality color profiles, as well as the new Pantone Color Manager color swatch bridging software. ColorChecker Proof, a new ColorChecker target for direct viewing analysis against a printed target and ColorChecker camera calibration system are also featured." Information about the new Super Plane to Line Switching (S-PLS) technology and screens from Samsung has been pretty scarce so far. We had some limited information about S-PLS back in December which talked about the technology a bit. All we really know is that it is designed to rival IPS and is supposed to offer wide viewing angles and fast response times. Samsung claim that Super PLS outputs 10% higher brightness and has even wider viewing angles than IPS panels. They also state that they are 15% cheaper to produce which should help drive down retail costs for the end-products. Whether S-PLS will replace IPS remains to be seen of course! We will know more about its performance when the first reviews emerge. More recently in February we had details about the first display from Samsung to use PLS technology, the 27" SA850. We have been following up with Samsung for an expected release date but at the moment all we really know is that it will be sometime soon, hopefully during the Spring. We will feature a review as soon as possible. We have now managed to find some further information about the PLS panel which will be used in the SA850 along with the forthcoming 24" PLS module. Of interest is the statement in the spec sheet that this panel will be able to produce 16.7 million colours and is a 'true 8-bit' module. Early details of the SA850 reported a support for 1.07 billion colours which would usually suggest the use of an 8-bit+AFRC or 10-bit colour depth panel. It looks like the LTM270DL02 will only be 8-bit, but perhaps this additional FRC stage will be done at the controller / LUT side as in many other monitors with so called "10-bit" / 1.07b colour support. The unit will be White-LED lit from one side and is slim in design. The LED bar consists of 80x LED's apparently. The surface treatment listed is "haze" but this does say it is to be determined. We are not entirely sure what this will involve at the moment. The SA850 is expected to be released with a 5ms G2G response time which would indicate that an overdriving circuit has been added to boost pixel response times. There will also be a 24" module release which will be the LTM240CL01. We have an overview of the spec for this panel, but at the moment have not seen the full datasheet. At this time there are no displays scheduled for release which will use this panel, but I expect they can't be far off. According to a product release schedule document both panels are scheduled for a "May 2011" release. I expect this could well hold up the release of the SA850 and any other screens using these panels if that is accurate. More info as we get it. We have added the panel information to our panel parts database. We would welcome any further information readers might have regarding S-PLS or the Samsung SA850. Please email us if you have anything interesting to share. After a long wait the 27" Hazro glossy screens are now available to buy in the UK. Hazro have struck up a deal with UK based online retailer Overclockers.co.uk to offer these very good screens to the masses. At the moment the HZ27WA and HZ27WC are available, both of which we tested in our recent review. The HZ27WB (CCFL, non glossy) is expected to be available in the coming weeks although there have been some delays in production. The two glossy 27" IPS screens are becoming a fast seller thanks to their fairly unique features and excellent low price point. The price point is a little higher than we originally reported in our review. At the time we had an estimated launch price for the HZ27WA of £499 (inc delivery and VAT). This was an expected promotional price from Hazro with final MSRP being ~£550. OcUK are now supplying the HZ27WA at £529.99 (inc VAT but delivery is extra). It's a little bit more than the expected offer price but it still makes it a very low price compared to some of the competition and certainly compared with Apple's 27" Cinema Display which is its direct competition. The HZ27WC was expected to retail for £399 at launch but OcUK have it priced at £439.99. Obviously there is a mark-up needed for OcUK as well but the pricing is still very attractive. I have updated our review to reflect these changes and details. 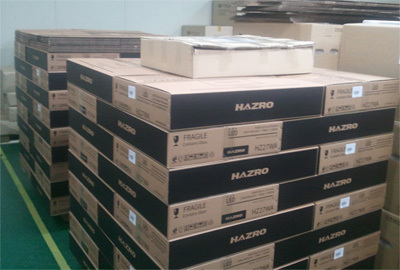 International customers will be able to place orders via Hazro's website in the near future. It should be noted that there have been some early reports of dust issues with the new screens, with small dots being noticeable behind the glass coating. In some cases these are being mistaken for clusters of dead pixels, but they do appear to be specks of dirt and dust. This is something we have seen in the past from other glass fronted screens and is very difficult to eliminate during production. In practice you may not ever notice it is of course unless you go looking using solid coloured backgrounds. I'll mention it so that people can excercise caution and this may well put some buyers off. Hopefully it will not be a big deal to others though as the HZ27WA/C is a very good screen at a very low price. 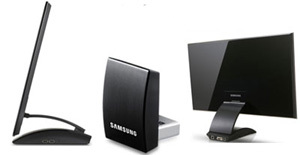 Samsung have recently released details on their website of their new 300, 350 and 550 series of monitors. Of particular interest are two new 27" models, which is fast becoming the norm for manufacturers and new buyers it seems. The whole 300, 350 and 550 series is being marketed with "breakthrough picture quality" thanks to their use of LED backlighting. Of course we know that's just the latest marketing hype and W-LED units are being used here which is nothing staggering. To further add to their eco-friendly image they are combined with automatic on/off 'ECO motion' sensors and ECO light sensors. Samsung will also be releasing other models in other sizes again with W-LED backlighting and similar features / selling points. These will form part of their 300, 350 and 550 series as well. These are the 20" S20A300B and S20A350B, the 21.5" S22A300B and S22A350H, the 23" S23A550H, S23A300B and S23A350H and finally the 24" S24A300B and S24A350H. "We have been inundated with press inquiries as well as customer requests for pricing/launch info. OCUK will take delivery of both the HZ27WA and HZ27WC models this week. Unfortunately, the HZ27WB still has a lead time as default factory calibration takes longer. A new website will allow international customers to purchase all models but we will be directing UK customers to OCUK. We will be sending OCUK the blurb + images for their website this week too and I believe they will allow pre-orders. Stock is limited but the next batch should be delivered in 3 weeks." Hazro confirmed for us that they are calibrating the HZ27WB's today and a small batch will be delivered to Overclockers by mid next week (hopefully). Additonally we have checked with Hazro but they are unsure what the final retail price will be for these new screens as they are set by OcUK. They should hopefully be as we anticipated in our reviews so I would hope that price will be around £550 GBP for the HZ27WA and HZ27WB, with perhaps a lower promotional price at launch. This is unconfirmed so I would suggest keeping an eye on their shop for pre-orders. The HZ27WC will be cheaper again so hopefully around the £400 mark. 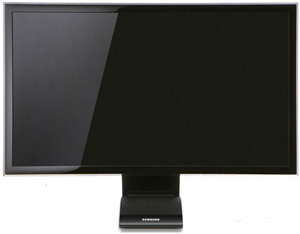 Samsung have recently announced the forthcoming C27A750 monitor in their range, this time featuring an innovative wireless capability. 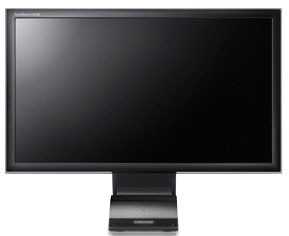 The C27W750 is a 27" monitor with a built in UWB (Ultra-Wide band) receiver allowing it to stream video content wirelessly from a device with their (supplied) UWB dongle attached. There is of course extra D-sub and HDMI interfaces featured, but this wireless technology could prove pretty impressive if it works well. There are also 2x USB 2.0 and 2x USB 3.0 ports included on the screen which are all powered. The C27A750 is expected to be released across Europe towards the end of April at around 600 Euro. Asus have recently released details of three new screens in their range. The 'Designo' series will feature two IPS based models in sizes of 21.5" and 23", along with an AMVA based 24" model. Of interest is the glossy screen coating used on all these new models, their full 1920 x 1080 resolutions, LED backlighting and expected low price points. They will also sport an ultra-slim profile and glossy black design. The ML249H will feature the same AU Optronics AMVA panel as the BenQ EW2420 we tested recently and is expected to retail for $250 USD / 299 Euro. The ML239H will feature the same panel as the NEC EA232WMi which we also tested and will retail for 269 Euro. There is no price available for the ML229H just yet. Eizo has announced the launch of its new ColorEdge CG275W, a 27” monitor for professionals in prepress, digital photography, graphic design, video editing, post production, and other graphics fields. 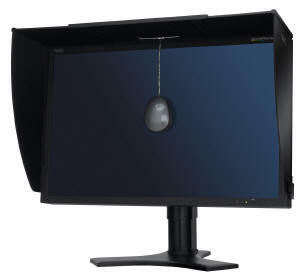 Eizo is exclusively unveiling the CG275W 27” self calibrating monitor at this year’s Focus on Imaging show. The CG275W features a built-in calibration sensor for self-calibration. It becomes the second monitor in the graphics industry with this capability, following Eizo's other ColorEdge CG245W model which was released last year. 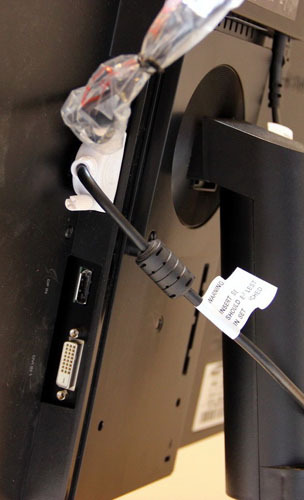 Self-calibration eliminates the need for a third-party external calibration device and improves work efficiency since the monitor can be scheduled to self-calibrate outside of work hours when the computer is turned off. The computer itself is not necessary so a self-calibrated CG275W can be used with any operating system. Their ColorNavigator software includes a “Correlation Utility” that matches the measurement results of the CG275W’s built-in calibration sensor to those of an external calibration device. This may be necessary in a work environment where the ColorEdge CG275W is used with other monitors and all measurement results need to be standardised. The panel supports 10-bit content (almost certainly 8-bit+AFRC) and has a programmable 16-bit 3D LUT. The gamma curve is factory calibrated and there is a wide gamut offering 97% coverage of the AdobeRGB space and 102% of the NTSC space. Eizo's Digital Uniformity Equaliser (DUE) compensates for fluctuations in brightness and chroma uniformity that are characteristic of LCD panels and a special Eizo-patented technology stabilizes the brightness after start up or coming out of sleep mode. 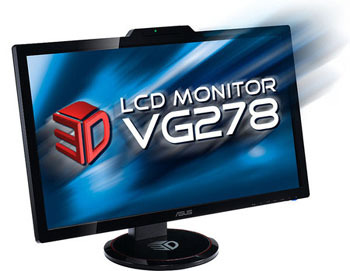 At this year's CEBIT event Asus have been showing off their new 27" VG278H monitor. The screen offers support of 120Hz refresh rates and 3D content which is of course of interest to gaming enthusiasts out there as this is one of the first of its size to offer this. The screen will reportedly feature W-LED backlighting and an in-built infrared emitter. There will also be integrated stereo speakers. No word on release date or price yet. 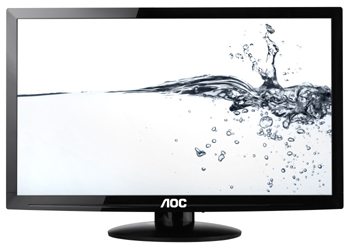 AOC have just annouced the release of a new 27" model in their range using an MVA panel and LED backlighting. It is likely that this is the same panel that will be used in the forthcoming BenQ EW2730V although we have yet to see confirmed information about that model, other than that it will be an AMVA + W-LED offering. The e2795Vh will offer a 1920 x 1080 resolution only which is a fair bit less than some modern high-res 27" panels. The panel is being aimed at entertainment and office use alike, and comes with a DVI and HDMI interface. There is also an integrated USB hub (4 ports) available and in-built stereo speakers. Thanks to the electricity-saving W-LED backlight technology current environmental standards such as ENERGY STAR 5.0, TCO or EPEAT-GOLD are fulfilled. 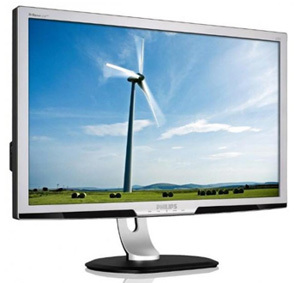 What is more, all monitors are manufactured entirely mercury-free. The e2795Vh will be available in April 2011. Retail prices have yet to be determined. 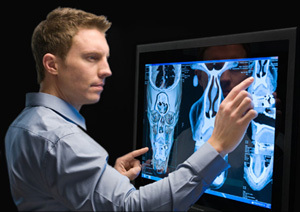 NEC's latest press release states: "With its SpectraView Reference 301, NEC Display Solutions is launching its flagship 30-inch model to complete its award-winning display range for colour-critical applications. The monitor, which can be hardware-calibrated, features a true 10-bit P-IPS panel that reproduces 1.07 billion colours and 107 percent of the Adobe RGB colour space. Thanks to its impressive size, high resolution and excellent uniformity, the monitor is ideal for the most demanding prepress and soft-proofing applications, as well as for professional colour-critical image and video editing". The new screen is an extension of the PA301W which is still not widely available it seems. This new SpectraView Reference 301 may also be referred to as the PA301-SV in some cases. Like the SV Reference 271 (which we reviewed recently), this new model offers a few extra features on top of the 'regular' PA301W. It will come with a calibration hood, SV Profiler software, full hardware calibration using this European NEC software (which the PA301W will not offer) and hand picked, tweaked and certified panels. This is the same story as with the 271 model so you can read more about this in our review. The SV Reference 301 is available now at a price of £2,915 GBP (exc VAT). 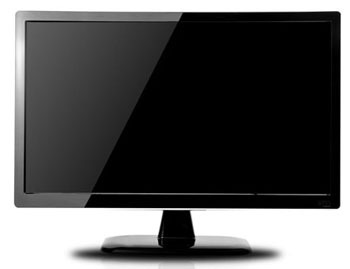 We have recently made a new addition to our comprehensive monitor Panel Part Database; which contains information about many display panels from a variety of leading manufacturers. This database now also contains the coverage of the Adobe RGB and sRGB color spaces. Unlike with NTSC, these numbers are the actual coverage of Adobe RGB and sRGB. 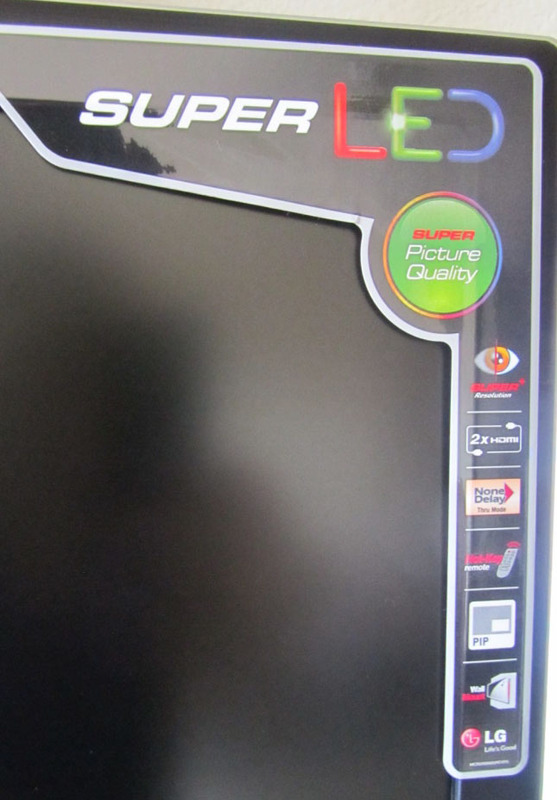 Display panel manufacturers usually mention the size of the color gamut of a panel in % NTSC. That number however does not represent the coverage of the NTSC color space, but rather the size of the gamut relative to the size of the NTSC color space. Those display panel manufacturers however also give the x and y coordinates for the extremities of red, green and blue for the CIE 1931 xy chromaticity diagram for each panel. Fortunately, color spaces such as Adobe RGB and sRGB are also defined by the coordinates of the extremities of red, green and blue in the same coordinate system. If you take the coordinates of those extremities and connect the dots, you’ll get a triangle. Calculate the overlap the triangle representing the gamut has with the triangle representing the color space, divide the size of the overlap by the size of the color space, multiply it by 100 and you’ll end up with the percentage covered. Some users on the Dutch computer forum Tweakers.net came up with a way to algebraically calculate that coverage in Excel. Together with a script they wrote to retrieve the coordinates from the datasheets and another script that runs the coordinates through the calculator, we managed to calculate these numbers with little effort. We have updated the database wherever possible using the data that we have available to us. There are of course gaps in some cases but it is as complete as possible at this point in time. We will of course be adding to this database and keeping it regularly updated as a resource. 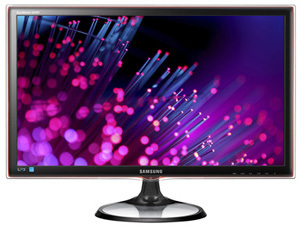 Last month we brought you the news of Samsung's new 3D monitors in their SA950 and SA750 series. Now Samsung have released information about their SA850 monitor which interestingly will be the first model to feature Samsung's own new Super PLS (Plane to Line Switching) technology. The SA850 is designed for "professionals sensitive to picture quality", and will cover 100% of the sRGB space. You may notice that this means the backlight is a unit which offers only standard gamut, so less than modern wide gamut solutions. This isn't necessarily a bad thing, as many users still prefer sRGB colour spaces. The PLS panel also offers 10-bit processing, although it's unclear at this stage whether this is a true 10-bit panel, or (more likely) a lower bit-rate using FRC to boost the colour depth. The 27" screen also comes with an ultra-high 2560 x 1440 resolution to match that of LG.Display's 27" IPS panels. The panel will also offer 178/178 viewing angles and a 5ms G2G response time. The SA850 will feature a fully adjustable stand, ECO light and motion sensor technologies. There are even some integrated USB 3.0 ports on the screen. From early photos of the screen it even looks like the housing will be a brushed aluminium finish, but that remains to be seen in the final release of course. In addition to the SA850, Samsung will also release the CA650 and SA650 screens. The CA650 is aimed at notebook users in the corporate and SMB space, while the SA650 is aimed at financial services and governments. These models will not use PLS panels, but rather MVA modules (should that be cPVA? ), offering a 3000:1 static contrast ratio. Other specs to be confirmed. 27"WS 2560 x 1440 5ms G2G ? ? ? 178/178 10-bit S-PLS Tilt, height, swivel, rotate DVI + ? There's no word on release dates or prices yet, but we will keep you updated. It's been a little while since we reviewed Hazro's first 27" monitor, the HZ27Wb (Dec 10). Readers have been patiently waiting for the final release of this model, and the HZ27Wa which will follow soon afterwards. Hazro have recently given us some new information about the release of these new screens which will hopefully clarify a few points. Hazro state that they have "been swamped with custom orders and admittedly, have failed some resellers in delivering consumer versions of these monitors on time [mods in the form of scalers, custom cooling, modified enclosures etc. are time consuming]. We have a backlog which will take approx 2 weeks to clear." The HZ27Wb (CCFL version) will be priced at around £500 inc VAT and Hazro say they will be taking orders in 2 weeks time and aiming to deliver before the end of the month and in early March. There have been no chages to this model since we reviewed it in December. The HZ27Wa (W-LED version) has apparently undergone several revisions and aesthetically is very different from what they had originally planned. The screen now comes with a plastic enclosure unlike the aluminium finish of the HZ27Wb. Hazro have promised specs, prices, images and reviews will be available before the end of the month and we are currently arranging a review sample of this screen to feature on TFT Central. Hazro also say that "the price will make the wait worthwhile" which sounds promising. 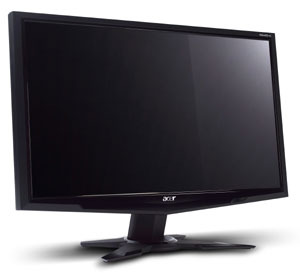 The monitor will be available in 2 suffixes: one featuring DVI only and the other featring DVI + HDMI + SPDIF + Component + VGA. The panel on both versions will be the same [LED IPS WQHD Glossy]. The 30" HZ30Wi-Q will be available at the same time as the HZ27Wb. The price has yet to be finalized but expect to pay just over £800 inc. VAT for that model. 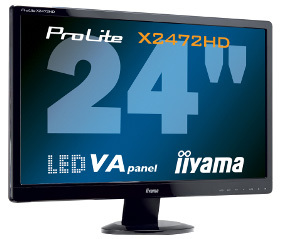 March sees the launch of Iiyama's first model to feature W-LED backlighting and a VA panel. 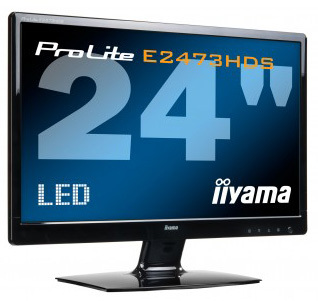 Iiyama's press release says "This new 24” display offers excellent colour performance and amazing viewing angles combined with the Low Power LED Panel is an ideal choice for Universities, Corporate, Financial and Design markets"
The screen looks to be using the same AMVA panel as the recent BenQ VA models, such as the EW2420 we reviewed a short while ago. The full spec and details are not known at this time unfortunately but I expect this could become a popular alternative for a low cost LED backlit display, offering a good alternative to the standard TN Film models in the market. The screen will be available at the end of February priced at £199.99 GBP inc VAT. More details as they emerge. Acer are proudly announcing the release of their new GN245HQ screen, the World's first to use the HDMI 3D solution from NVIDIA, enabling users to fully appreciate the array of possibilities brought by the stereoscopic technology. The screen is aimed primarily at gamers and movie enthusiasts and comes packaged with a set of NVIDIA's 3D shutter glasses. The screen uses modern W-LED backlighting of course as you can expect from most new screens being released. To support 3D content, the screen offers a full true 120Hz refresh rate much like the BenQ XL2410T we tested recently for instance. There are 2x integrate 2W speakers as well and the stand offers a basic tilt function. 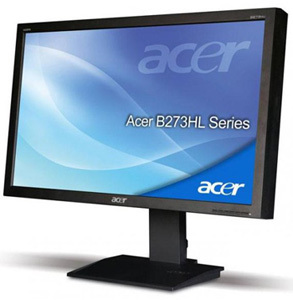 The Acer GN245HQ will be available from mid March as it stands at the moment with a RRP of £419.99 GBP inc VAT. We have recently discovered some more detailed information about the operation of the latest generations of IPS and PVA panels from LG.Display and Samsung respectively. I wanted to make a brief mention of the information here for clarity and to avoid confusion. e-IPS - These new panels have been in production for some time, with modules available in 21.5, 22, 23 and 24" sizes and widely used in modern popular displays. Originally the information available about all these modules suggested that they were true 8-bit displays, supporting 16.7m colours. This was in keeping with traditional S-IPS panels as well. LG.Display's website only lists basic information summaries against their panels, and in fact nowadays doesn't even give the full part number. While the e-IPS modules are not listed here any more, they were originally listed as "8-bit" in the brief description and so reviews of models using these panels will refer to them as 8-bit displays. We too fell into that trap based on the information available at the time. However, recently we have been able to study the detailed LG.Display product datasheets which describe the inner workings of the panels for OEM's looking to use them. We discovered that some of the e-IPS panels are in fact using 6-bit colour depth, with Advanced Frame Rate Control (A-FRC) to produce the 16.7m colours, similar to how TN Film panels operate. This doesn't apply to all the e-IPS panels as you can see from the table below. I would expect this was a cost saving measure and at the end of the day, most regular users would never know or care. EDIT: Apologies, we had wrongly merged the NEC series screens into the same category as the Dell U2311H, when in fact they use a slightly different panel part (SLA1 instead of SLC1). Thanks to user feedback, this has been updated in the above. Now this isn't really a massive issue in our opinion. Yes, it might make a difference to some people who are looking for a true 8-bit compatible display, but most regular users would never even notice any difference with panels using modern FRC mechanisms. In fact we saw no adverse affects of this technology when we reviewed some of these monitors either and neither did other review sites. I'm only bringing it up to offer full transparency and for those interested in the detail. I have also updated the relevant reviews with mention of this change. Also, keep in mind that the same situation can be found when you consider the modern "10-bit" panels. LG.Display again list their new 24, 27 and 30" modules as being 10-bit, and you will see highly regarded manufacturers like NEC and Eizo (and others) refer to their displays as 10-bit. In fact, with the exception of a couple of very expensive models, these screens are all using panels which feature an 8-bit+AFRC colour depth, so again, not a true 10-bit! Some models don't even use an 8-bit+AFRC panel, but carry out the FRC at a hardware LUT level instead of on the panel side. So there's no difference there really. cPVA - Although information is a little more scarce for these modern PVA panels, I thought I'd make a quick note about them here as well. Being PVA, it is probably assumed that these are true 8-bit panels as well. Samsung don't actually list the colour depth on their Samsung Panel website so thankfully that is not causing confusion. Again, studying the detailed datasheet for the known cPVA parts (23" LTM230HP01) confirms that the panel is actually 6-bit + Hi-FRC. We do not know the other Samsung cPVA panel parts at present, but suspect the 20" module is the same situation. While nothing spectacular, I thought I'd give mention to Iiyama's latest 24" (23.6") W-LED screen which is being released this month. The new E2473HDS will feature dual HDMI connectivity enabling greater flexibility with external multi-media devices. One connection is located on the back of the screen as you'd expect, while the second is located on the side for easy access which is a nice touch. Other than that, the screen has DVI and VGA connections. 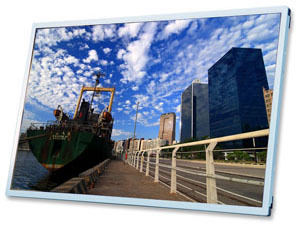 The E2473HDS uses a TN Film panel and offers a fast 2ms G2G response time, and high 5 million:1 dynamic contrast ratio. The screen is available this month at a price of £160 GBP exc VAT.